3. Douglas Stoneson Sr. > Living Stoneson Jr.
relationship with the Stoneson side of your family only extended to Stone Stoneson through his mother Jóhanna who was my great-grandfather Kjartan Einarsson's half sister. Roy just spotted right photo out of the 6,000 here on OCT 9th after seeing Sue Graham's submitted one (Left). Note little 14 with his tongue out. if you are related to Ingibjorg Einarsdottir, then you are related to Johanna. Since the Clan pages are by Recent to Oldest, this photo is here due to connection of Einar Skeggjason. You will see the same wooden tower behind #2 below. The other 9 people are not in above photo! Nick's Rockaway beach in Pacifica nad the Point being Nick's Restaurant . Roy: "That's the Andy that died in the car accident?" 04. Unknown, bent over-will never know. 09. Bertha Stoneson. Sixteen and Ten are related. 13. 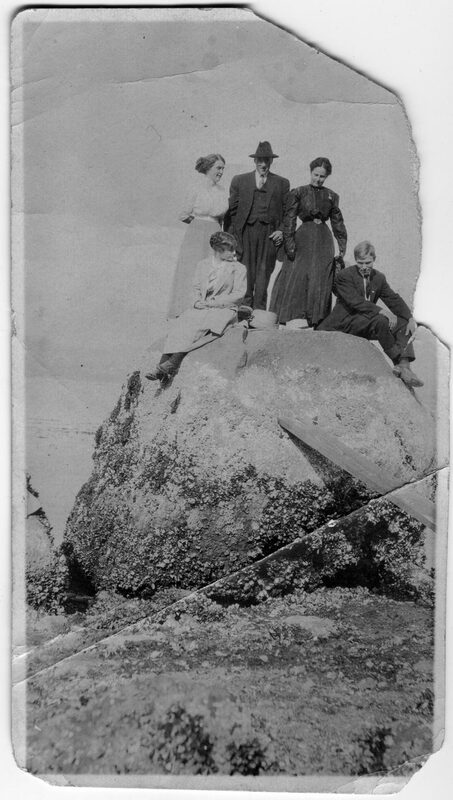 Emma STONESON Oddstad, Left of Bud, wearing White hat. 17. Elma Mendola?, Andy's sister, kneeling in front of Andy-hard to confirm with face turned. 17., Unknown facing Left, Ft. Row, far left? 22. Roy: I believe Caroline is facing towards Dot. Hope to show Hank better copy and number them and verify. Grandma Stoneson 3rd lady, 2nd line from top on the left. Little old ladies to her left and below, possibly her aunts. "My husband Bruce is a grandson of Ellis Stoneson"
Great Granddaughter of Henry Stoneson. daughter of Helen. Henry & Ellis's sister Rooney (Gudrun Runa Thorsteinsson), married Kjartan Christopherson, son of Sigurdur Christopherson. Photo Caption Backside: "Emma, with Pearl and Andy Jr."
of PT. Roberts verified by Pauline's PT. Roberts Newsletter. Runa is the daughter of Helgi and Dagbjort Thorsteinson. She married Ben Thordarson and they started up Ben's Store. he was in the directories as a carpenter. Charlie had remarried and had 3 more children and also a carpenter, living in South Vancouver. Charlie and father Jon still owned the quarter section and a nearby lot on Nicomekel river." Blaine Washington at the Stoneson house. Uploaded a LARGE version which shows barnacles attached to the rock. Ruling out White Rock in Gimli, MB and Crescent Beach, BC. Roy has one more photo of Gudrun about age 11 or 12 here. Too bad the photo was torn. Emma and Guðrún are sisters of Henry & Ellis. Woman in front might be their grandmother, Leopoldína Níelsdóttir or Jóhanna Einarsdóttir seen below Left. Emma Stoneson Oddstad in to the rear left. Guðrún (Rooney) Stoneson Christopherson is to the rear right. Stoney Stoneson in front left. Stoney Stoneson or officially known in Iceland as Þorsteinn Þórsteinsson, son of Þorsteinn Þórðarson, son of Þórður Þorsteinsson, and his wife Ingibjörg Einarsdóttir, daughter of Einar Skeggjason, who was the son of Skeggi Jónsson, whose ancestor was Skeggi Atlason, born 1620 in Iceland. Online has him as Stoney Stoneson, that is an ERROR. Taken me four years to get that straight. This vintage photo verified against one Nelson Gerrard has in his collection of that area.